Are they the worlds watchdog that can dictate to any country in the world??? Why can the DEA bust Bout in Thailand and get away with it when no drugs were found on him and what gives them the right to use Thailand as a base--luring him to Thailand. What if Thailand Police arrested one of the US arms dealers in USA and pinpointed that dealers involvement in arms deals in SE Asia??? November 18, 2010: Victor Bout, was extradited to the US to face "trial". He is currently standing trial at Manhattan Federal Court U.S. District Judge Shira A. Scheindlin for alleged arms trafficking to narco-terrorists “for use in trying to kill Americans.” Bout is a scapegoat of both the American and the Russians, who we noticed made loud protestations at Bout’s extradition to the US. Bout remains in Thai detention despite a court ruling for his extradition to the United States. He is currently held while the Thai courts investigate new charges filed by the U.S. concerning money laundering and wire fraud filed shortly before an extradition verdict was heard ten days ago. Bout’s lawyer fought the extradition ruling under Thai extradition law (1929), based on the signed agreement by both Thailand and the United States that documents pertaining to any potential extradition case can only be filed once.The USA have broken this law. The U.S. had a previous ruling on Boats extradition denied by the Thai courts in 2009 on claims that he aided a foreign terrorist organisation in procuring weaponry. In addition to this month’s successful extradition verdict and the ongoing case in Thai court, Bout’s lawyers say this violates Thailand’s extradition law and therefore negate the previous court ruling. In addition, lawyers working on Bout’s defence state an infraction made by prosecutors under Thailand’s Criminal Code (article 125), which specifies a case cannot be filed for indictment until questioning has been carried out on a suspect, consequently negates all previous decisions. Bout was and has never been questioned by a prosecutor before any of the cases were submitted to court. Nation News August 2009 : Washington - A Thai court's refusal to extradite a Russian man to the United States to face weapons smuggling charges was disappointing, the US State Department said Tuesday. The Bangkok court concluded the evidence against Viktor Bout was insufficient and dismissed the case, leaving prosecutors with a 72-hour window to file an appeal. "Obviously, we're disappointed in the court decision," State Department spokesman PJ Crowley said, adding Washington was hopeful an appeal would be successful. "There is a prospect for the Thai government to appeal this lower court verdict," he said. "But what they decide to do will be governed by Thai law." Russian Foreign Ministry learned with much satisfaction the reports on Thai Criminal Court’s decision to free the Russian citizen Viktor Bout, who was suspected of planning a sale of weaponry to the Revolutionary Armed Force in Colombia (FARC), the ministry’ s deputy official spokesman, Igor Lyakin-Frolov said Tuesday.Earlier in the day, the Thai Criminal Court issued a non-guilty verdict to Viktor Bout, thus denying a request from the U.S. to extradite him.The court ruled the Revolutionary Armed Forces of Colombia (FARC) was a political organization and not a terrorist one, as the U.S. had claimed. Bout was found guilty of conspiracy to kill U.S. citizens, conspiracy to kill U.S. employees, conspiracy to acquire and use anti-aircraft missiles and conspiracy to provide material support to a terrorist group. 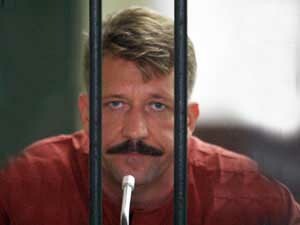 New York jury convicted Russian arms dealer Viktor Bout of trying to sell heavy weapons to a Colombian terror group. He could face from 25 years to life in prison. Assistant U.S. Attorney Guruanjan Sahni said Bout wanted to sell weapons to persons to kill Americans but one of Bout’s lawyers, Albert Dayan, said the alleged arms dealer was simply trying to sell two cargo planes he had, not weapons. 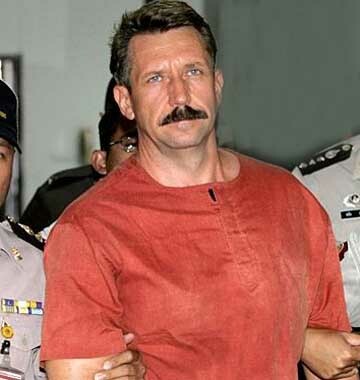 A Bangkok court has dismissed a US request to extradite Russian arms trader Viktor Bout.The court yesterday ruled the charges against him were political and not punishable by Thai law.US officials said they were "disappointed" by the verdict. Thai prosecutors are considering an appeal. The Bangkok Criminal Court court ordered Mr Bout be released by Friday afternoon if Thai prosecutors had not lodged an appeal by that time. Mr Bout, 42, rushed to hug his tearful wife in the courtroom after Judge Jittakorn Pattanasiri read the verdict clearing him of terrorism charges. "I can't talk. There are so many emotions. I was very worried," wife Alla said. Portrayed by the media as "the Merchant of Death" for his arms trading, Mr Bout was arrested in a Bangkok hotel in March last year in a sting operation. Agents from the US Drugs Enforcement Agency posed as rebels from the leftist Revolutionary Armed Forces of Columbia (Farc) seeking to buy millions of dollars in arms, including surface-to-air missiles, from Mr Bout. The US officials alleged Mr Bout's agreement to sell arms to Farc was tantamount to an act of terrorism, as the weapons would be used by the rebels to kill US citizens and destroy US property in Columbia. The US made its extradition request to the Thai government based on the argument that Mr Bout was involved in a terrorist conspiracy to target the US. Farc is proscribed as a foreign terrorist organisation under US law. But Mr Bout denied the arms trafficking charges, saying he worked in the aviation and construction industries. The court yesterday dismissed US claims that Farc would use the weapons to kill US citizens and destroy its property due to a lack of evidence. The court said, based on statements by prosecution witnesses, Farc's aim was to overthrow the Columbian government. As such their violent actions were considered political, as was Mr Bout's alleged support of Farc. Bout was arrested by a bunch of American DEA agents though never accused of any drug crimes anywhere. So we have the DEA acting as world police & being a Policeman in Thailand with not so much of actual crimes but of morals. USA is, after all, the world’s biggest arms merchant and has a long history of selling to both sides. They can’t stand competition? Having lost the extradition case, the United States government has asked the government of Colombia to write a letter to the government of Thailand begging to allow the extradition of Victor Bout to the United States!!!!!!!!!!!!!!!! Feb 2010: This latest indictment also charged Bout with money laundering conspiracy, wire fraud conspiracy, and six separate counts of wire fraud. The charges are just the latest attempt by the US??? BUT WHATS THE DIFFERENCE WITH RUSSIAN VICTOR BOUT AND THE USA FRANCE ETC SUPPLYING ARMS TO MANY DICTATORS & ROGUES. Canada's defence industry accounts for 650 firms, and 57,000 direct jobs, while the Canadian Defence Industries Association puts the figure at 1,559 firms. CDIA employment numbers roughly match those of the CCC. The Canadian defence industry sells about $5 billion dollars of goods and services per year, half of which are exported so maybe they export to whoever????. A U.S. dealer who has grown rich moving arms for governments is Sarkis Soghanalian, president of United Industries, with branches in Miami, Beirut, Madrid, Athens, Geneva, and Baghdad. Sitting in his office atop a private hangar at Miami International Airport, Soghanalian claims his sales exceed $1 billion a year, with profits at 10%. He has a stable of Arabian horses, homes in Athens, Madrid, and Paris, as well as Miami, and a fleet of jets and helicopters to whisk him and his weapons anywhere at a moment's notice. Could he be the world's biggest arms merchant? Soghanalian a Lebanese worked for the CIA as a client and his fortunes turned. German-born Ernst Werner Glatt, a man who used to buy weapons for USA CIA man Cummings in East Germany. Colleagues say Glatt got rich supplying the CIA with East bloc weapons for Afghanistan and the contras. Glatt with about $200 million a year in steady business and a multimillion-dollar Virginia farm called Black Eagle. Black Eagle Farm however was being foreclosed for failure to pay a $5.29 million loan from a Charlottesville bank & $56,000 in local taxes. Sam Cummings, 59, an amiable, American-born British citizen and former CIA agent. Cummings learned his trade traveling around Europe after World War II buying stashes of surplus weapons for the CIA. In 1953 he went into business for himself, buying arms from both the East and West blocs and reselling them for whatever the market would bear. Cummings says he does about $80 million a year in sales from offices in Virginia, England, and a penthouse in Monte Carlo that is just steps from the onetime home of Sir Basil Zaharoff, an infamous turn-of-the-century arms dealer. LIKE MOST arms merchants, Cummings says he would sell to almost anyone if the government allowed it. Jean Bernard Lasnaud, who deals arms in his south Florida condo under the USA protection yet this man sold arms to Croatia, Ecuador & Sierra Leone where arms to rebel forces had been embargoed since 1997 etc. Between 1992 and 1995, Argentina's President Carlos Menem signed decrees authorizing sales of Argentine-made arms to Uruguay and Panama. But instead were sent to Croatia, which was under a U.N. arms embargo, and Ecuador, embargoed by the 1945 Rio Accord because of its ongoing war with Peru. Lasnaud dealt missiles, tanks, and rocket launchers from his condo in south Florida with impunity & even after Argentina requested his extradition the USA said no? Lasnaud's Caribbean Group sold $1-2m worth of arms a year & in 2002 he took off from the USA & disappeared. It is unclear if he was ever sent to Argentina or prosecuted. Two years after his arrest, he was again selling arms through his websites Transcon Services in Montreal, and General Equipment Corporation International in Tamarac, Florida. His ability to operate unhindered in the US is because he is considered an “asset” to US agencies providing services to the US, as well as to countries like Croatia which the US wanted to arm but could not because of the UN embargo. The U.S. Department of Justice had refused to pick him up while he lived free and easy in the USA, citing "insufficient evidence"
Like Lasnaud, Lebanese citizen Sarkis Soghanalian is another arms dealer in the international arms trade – both of them receiving pat from the US. With more than 40 years of experience and billions of dollars in brokered deals, Soghanalian insists that all his deals - whether they were with Saddam Hussein’s Iraq or rebels in Central America – were done with the approval of the US government, according to a web portal on international arms deal. He died at age 82. He became a major arms supplier to Hussein during the Iran-Iraq war in the 1980s, operated a fleet of cargo planes and owned homes in a dozen countries but because he could speal several languages was as asset to the US it is believed. Monzer Al Kassar from Syria started out as a petty hashish drug dealer who then went into the business of selling illegal sale of Polish arms to Croatia and Bosnia. He was extradited from Spain to the US in 2008, as he had agreed to sell weapons to informants working for the United States. Kassar had agreed to sell surface-to-air missiles and other weapons to the FARC. The informants being DEA had said the weapons would be used by the group to kill American military personnel in Colombia so he was sentenced to jail it seems for 30 years Sept 2011? Chilean, Luis Felipe Moreno Godoy, an associate of the international arms dealer Monzer Al-Kassar was sentenced to 25 years in federal prison. In 2007, AL KASSAR and MORENO GODOY agreed to sell to the FARC more than 12,000 weapons — including thousands of machine guns, rocket-propelled grenade launchers, and surface-to-air missile systems, or “SAMs” — along with 2 million rounds of ammunition.” Moreno, 60, was caught in Bucharest a couple years ago, but had been living in Spain. Leonid Efimovich Minin, a thug from the Ukraine. He was arrested in 2001 for arms charges smuggling and distributing illegal weapons into Italy Minin & was a mafia type criminal after the eatern bloc came apart & was charged with international gun smuggling and using a fake EUC to sell arms to Liberia and Sierra Leone. He is implicated for his role in two shipments: 113 tons of arms delivered to Ivory Coast on July 12, 2000; and 68 tons to Burkina Faso on March 13, 1999. US COMPANIES like General Dynamics one of the USAs biggest arms dealers sells billions of arms from M1 tanks to submarines and F16s. Its General Manager Panagiotis Takis Veliotis, was indicted on kickback, fraud, conspiracy, perjury, and racketeering charges & then came William Anders, GD's chief 1991-1993, who pocketed $44.3 million in earnings and stock benefits, becoming the highest-paid executive in the defense industry. During the 1970s, U.S. companies sold to the Chilean junta and to the Shah of Iran. In the 1980s it was Stinger missiles for the mujahaddin in Afghanistan (the CIA budgeted $55 million to try and buy them back in 1993), and arms for the drug-running contras and secret missiles for Iran & then Bin Laden himsel and the list goes on. Prior to the Gulf War, the USA armed Iraq and today theres no stopping the supply of weapons as we see the use of white phosphorus bombs banned being used by Irael on the Palestinians in Gaza Jan 15th 2009. White phosphorus was used in 1988 by Iraqi forces against its own Kurdish citizens, 1993 by Israeli forces in Lebanon, 1994 by Russian forces in Chechnya, in 1995 by Serbian forces in Serbia, in 2006 by Israeli forces in Lebanon,in 2004 by American forces in Iraq, and in 2008-2009 by Israeli forces in Gaza---yet these governments do not care about the harm to citizens. After the 1967 war, France stopped supplies of uranium to Israel. These supplies were from former French colonies of Gabon, Niger, and the Central Africa. France dropped arms to Libya to overthrow Gaddafi and now has the problem of trying to get them back as they may be used against France by the rebels?? who received them?The main arms suppliers to Bahrain, Egypt, Libya, Syria and Yemen since 2005 are Austria, Belgium, Bulgaria, Czech Republic, France, Germany, Italy, Russia, the UK and the USA. At least 11 states have provided military assistance or allowed exports of weaponry, munitions and related equipment to Yemen, where some 200 protesters have lost their lives in 2011. These include Bulgaria, the Czech Republic, Germany, Italy, the Russian Federation, Turkey, Ukraine, the UK and the USA.Spanish cluster submunitions and MAT-120 cargo mortar projectiles, licensed for sale in 2007, were found in Misratah by Amnesty International, when it was being shelled by al-Gaddafi forces earlier this year--these were banned?? At least 20 states have sold and supplied small arms, ammunition, tear gas and riot control agents, and other equipment to Egypt. The USA has been the biggest - annually providing $1.3 billion. Others include Austria, Belgium, Bulgaria, Italy, and Switzerland. A businessman jailed in the US on accusations of being an international arms dealer, Viktor Bout, is one of the Russians who has spent the longest period of time in a US prison in recent history. He has been in custody for a decade now, after being arrested in 2008 in Thailand during a sting operation. He was convicted in the US in 2012 on a charge of conspiring to kill American citizens, by selling weapons to the Revolutionary Armed Forces of Colombia (FARC), and was handed a 25-year sentence. The businessman himself has denied accusations. As the scandal developed he's been in the media spotlight. While talking to reporters he spoke about life in the US high-security prison claiming that a maximum-security prison he is in spends hundreds of thousands of dollars on every prisoner from the US budget. Nevertheless, the conditions in the facility leave much to be desired and “nobody ever investigated” why the cost is so high, he said. Bout was also highly critical of the US justice system by calling it a “cheap farce” and saying that the only reason behind his incarceration was to "intimidate other Russians". It was also him, who said that the US offered him a deal in exchange for "telling the US authorities about corruption in the Kremlin." Still, he remains full of optimism and says that yoga, learning foreign languages and anecdotes keep him in good shape both physically and mentally.